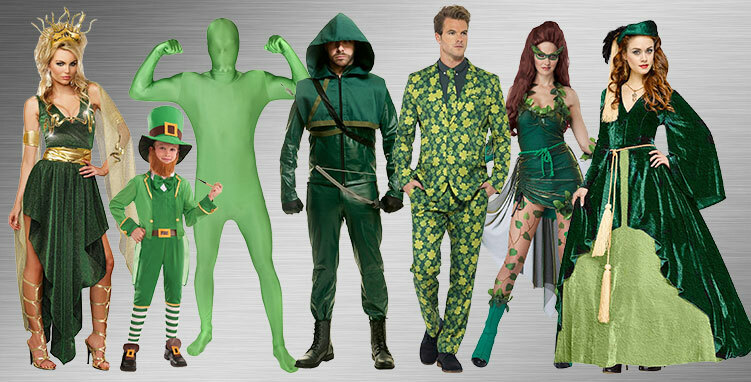 Go green this Halloween or March when you choose items from this collection of St. Patrick's Day Costumes! From full costumes covered in green four-leaf clovers to helpful accessories like knee-high socks, green sparkle shoes, bow ties, bracelets, headbands, and lots more. Become a bonny Irish lass or a Leprechaun with ease! Everybody is Irish on March 17th! Don’t miss out on the celebration and revelry just because you don’t have anything green to wear. A lack of green may lead to a firm pinch, but donning it just may lead you to the hidden pot of gold. You never know just how lucky you may be! 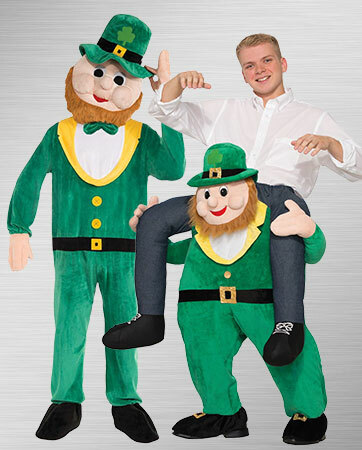 BuyCostumes has numerous options to help you celebrate this holiday in style. Whether you are cheering on a parade, hunting for the pot of gold or holing up in a pub, you are sure to have a whale of a time. Put on your biggest smile and start hunting for shamrocks, because after the day is over you will want to take a four-leaf clover with you as a lucky charm. Coins and gold only get you so far, but a pint of beer will make you feel like a star. This St. Patrick’s Day, be the man who everyone is looking for. You may find yourself speaking with an accent or partaking in some mischief to avoid being found. Don’t blame it on the beer, though, because that’s just what leprechauns do. Make sure you are careful not to get caught, because then you will have to grant three wishes! And when the libations are flowing freely, people will surely to try to press their luck. "May your pockets be heavy and your heart be light. May good luck pursue you each morning and night." You caught one — your very own leprechaun to grant your many wishes! You will surely get a laugh or two with this fun costume. From the beginning of the celebration into the wee hours of the morning, everyone will know that you are looking to have a good time. Guests will be seeing green when you all walk into the party together. And not just because their vision will be flooded with the color, but because they will be loaded with envy as well. All of these green costumes are as stunning as the next. This green gang has enough of the emerald hue to go around. Each of your friends will be able to dress up in the color of the shamrock even if they don’t all want to look like four-leaf clovers or leprechauns. There is a great costume just waiting for each of your friends, and with so many different styles and green characters you may even get a second use out of it when Halloween rolls around. Now that is one way to hit the pot o’ gold. Erin go Bragh! Keep it classy this St. Patrick’s Day with a debonair duo for him and her. This is a couple’s costume that each half will actually want to wear! An opportunity like that doesn’t come around very often. She will feel like a regal Irish princess and he will feel like an Irish Rico Suave. Whether you are attending a party, parade or a fun-filled ball, these costumes will turn heads and drop jaws. With luck on your side, you may even get a few free drinks out of it. The perfect couple, just like you two were made for each other. All things St. Patrick’s Day rolled into one dashing duo. 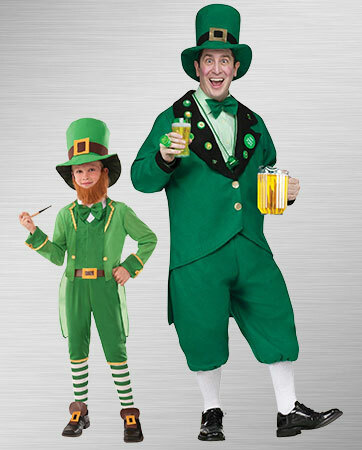 With a mischievous leprechaun and a refreshing pint, you two will be the life of the party and rather entertaining. Your friends will laugh and strangers will be eager to take pictures with you. Be prepared to answer prying questions as to why you are drinking your friends if you are sipping a beer — you may want to stick to whiskey tonight. There is nothing better than sharing in some fun and games with your little one. 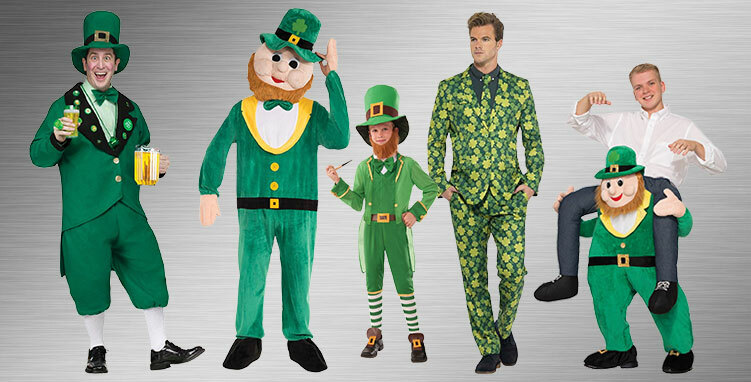 Get dressed up this St. Patrick’s Day and take the celebrations to a whole new level. With your magical powers, you two can do just about anything. Take a stroll through the woods on a hunt for the elusive four-leaf clover or follow a treasure map to find the pot of gold. Keep the crowd in stitches with these two hilarious St. Patrick’s Day costumes. Give them a laugh or hand them a pint. Either way, you will be on the fast track to making a few new friends. One of the best traits of a leprechaun is his sly way of playing tricks on people, so be sure to involve the other guests in your comedy routine. Your wishes have been granted — you can finally go over the top with your celebration this year! 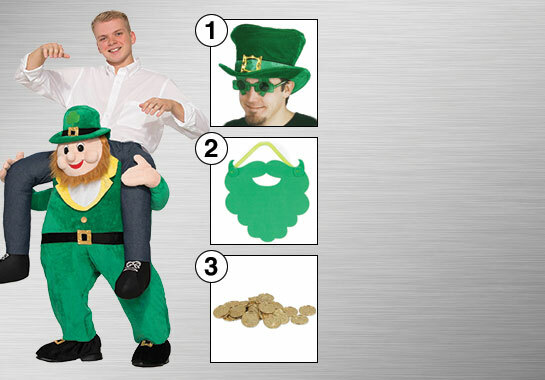 With your own personal leprechaun, you will have everything you have ever wanted. The fun and games are just getting started and in this funky costume you could go all night long. Toss golden coins to passersby as you beam in your green top hat and even a green beard. All that green beer must be rubbing off on you!